Execute tasks (with minimum demand for technical/professional skills) to replicate known manufacturing processes and solutions for incremental or continuous improvement in cost, quality and service. The rapid growth of manufacturing sector in India has substantially benefitted from manufacturing process solutions already available from across the globe and replicating them. But, there is an increasingly growing need to develop Advanced Manufacturing solutions whose implementation in shop floor will create a large scale impact. This is very essential for long term vitality and competitiveness of these companies and to many of their suppliers such as Machine Tool manufacturers, Tooling suppliers, and component fabricators, etc. Skills required for advancements in manufacturing solutions are always a hybrid between Academic Knowledge and Industrial Know-how. They also require active collaboration across many industries and suppliers. Investments required for new manufacturing process solutions are always high and hence seen more risky. Above all, they require people who can identify new opportunities and Transform them into solutions of commercial impact. These Transformational Skills for Advanced Manufacturing will require formal education for manufacturing professionals with sound academic background and proven track record of success in their current industrial profession. This seminar addresses the following questions to benefit those engaged either directly or indirectly in manufacturing of products. Ö What are the emerging needs for competitiveness of Manufacturing Companies and Industries in the global market place? Ö Need for “New solutions” that create a step change Vs. Current practices of lean and Six Sigma? Ö Transformational Skills necessary to identify, create and implement advanced manufacturing solutions. 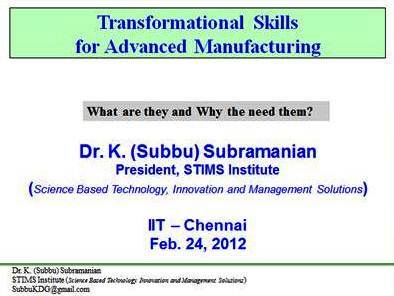 Ö Education and Training programs required for Transformational Skills for Advanced Manufacturing? This meet will provide an opportunity to share the views of practicing engineers/managers with the speaker who has been engaged in addressing the issues with his vast experience in the manufacturing field. The participants are encouraged to bring a set of identified needs that are relevant to their company. This seminar specifically looks at the needs of professionals and their requirements pertaining to education and skill development for grooming them into successful and high potential employees. There will be an opportunity to discuss these needs in a group setting as well as one-on-one with the speaker and other faculty members during this seminar.